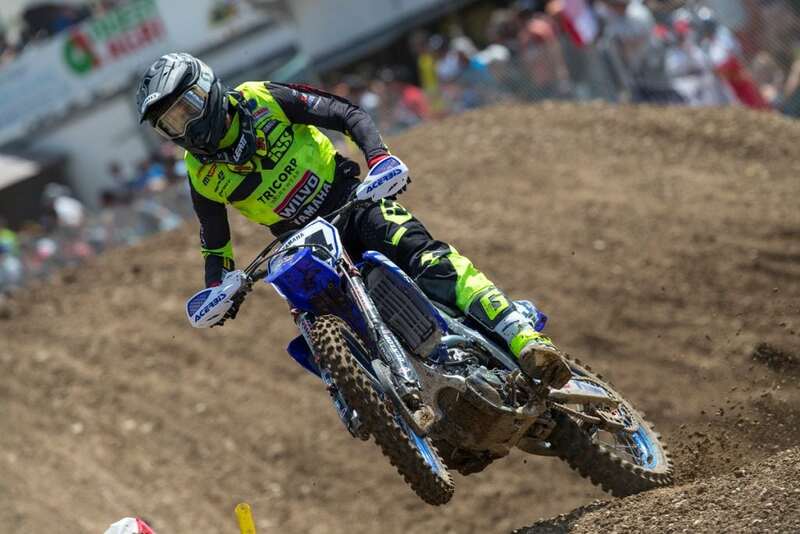 The treadmill rate to results and full-speed recovery is now firmly winding-up for Shaun after a an 11-13 for 10th overall at St Jean D’Angely yesterday for the Grand Prix of France and the tenth round of twenty in 2018 MXGP. The hillside circuit was a hard-pack and rutty test for practice and qualification on Saturday but increased in difficulty and technical demands on Sunday after heavy thunderstorms battered the venue during the evening. The event was busy and typically atmospheric. Shaun was competing with his Wilvo Yamaha YZ450F for only the second time since fracturing several ribs and cracking his hip in a practice spill for round six in Russia. The aim was two steady moto results – his first double points-score since the fifth Grand Prix of the year in Portugal (where he struggled with a weak shoulder) – and another step somewhere near the kind of form that delivered victory in the Indonesian GP fourteen months ago. Simpson will engage in his third Grand Prix in as many weeks with the Lombardia round at Ottobiano, south of Milan and the first of three sandy fixtures in the second half of the world championship slate. #24 wants more progress, and further gains at the site of his blameless crash and broken arm last year is an appropriate place to keep the machine rolling.